The Globe Eyed Tree Frog may also be known as Ruby Eyed Tree Frog or Uluguru Forest Tree Frog. These are a cool temperature species from the mountains of Tanzania. What does the Globe Eyed Tree Frog look like? One distinctive feature of the Globe Eyed Tree Frogs are the eyes; these are large and ruby red in colour. The body colouration is a typical dense green to bluish green with some specimens having white to yellow spotting or ring patterns on the back. It is believed that this resembles a decaying leaf with spots of fungus on it. They are a small to medium species with males reaching 3-4cm whereas females are slightly larger at 4.5-5cm. Males are easily distinguished by having a blue throat. Reduced webbing is present on the feet and the tympanum (ear) is small and indistinct. Where are Globe Eyed Tree Frogs from? The Globe Eyed Tree Frogs are found living on Banana leaves in cultivated clearing in the forests of Usambara and Uluguru Mountains of Tanzania. 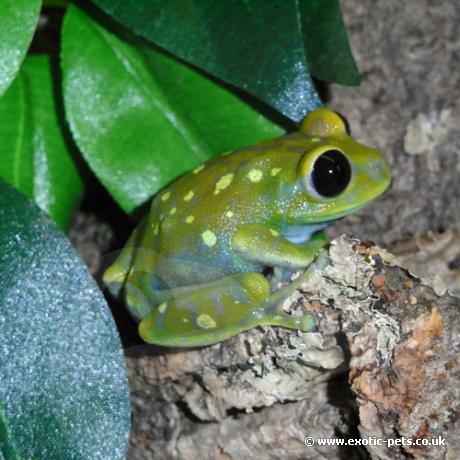 How do you keep Globe Eyed Tree Frogs? A group of 4-5 frogs are best kept in a tall glass terrarium of at least 45x45x60cm (LxWxH) due to their active nature during the night. A canopy top with a 5% UVB compact bulb and low wattage daylight bulb should be used during day time hours. The climate temperature information for the Uluguru Mountain is between 21-26C (70-79F) with an average of 24C (75F). The annual rainfall is 2100 mm on the eastern slop whereas 2900-4000 mm can be expected on the western slop. Therefore, Globe Eyed Tree Frogs require daily misting; ideally a misting system would be the best option. Placing a deep coco soil substrate covered with moss will help keep humidity levels up. Plants and branches should be placed in the enclosure for coverage and resting areas during the day. Water can be provided by two methods; the use of a large water bowl or by using the bio-drain products to make a natural water feature with running water. Feed a varied diet of insects, these should be gut loaded prior to feeding to your frogs and dusted with a vitamin and calcium supplement.